Jason shared some thoughts on designing progressive web apps. One of the things he's pondering is how much you should try make your web-based offering look and feel like a native app. This makes me squirm. I mean, I'm all for borrowing good ideas from other media—native apps, TV, print—but I don't think that inspiration should mean imitation. For me, that always results in an interface that sits in a kind of uncanny valley of being almost—but not quite—like the thing it's imitating. Anyway, I think my squeamishness about all the advice to imitate native apps is because it feels like a cargo cult. There seems to be an inherent assumption that native is intrinsically "better" than the web, and that the only way that the web can "win" is to match native apps note for note. But that misses out on all the things that only the web can do—instant distribution, low-friction sharing, and the ability to link to any other resource on the web (and be linked to in turn). Turning our beautifully-networked nodes into standalone silos just because that's the way that native apps have to work feels like the cure that kills the patient. Progressive—build in a layered way so that anyone can access your content, regardless of what device or browser they're using, rewarding the more capable browsers with more features. Web—you're building for the web. Don't lose sight of that. URLs matter. Accessibility matters. Performance matters. Jason asks questions about how your progressive web app will behave when it's added to the home screen. How much do you match the platform? How do you manage going chromeless? And the big one: what do users expect? In all the messaging from Google about progressive web apps, there's a real feeling that the ability to install to—and launch from—the home screen is a real game changer. I'm not so sure that we should be betting the farm on that feature (the offline possibilities opened up by service workers feel like more of a game-changer to me). I like Android's add-to-home-screen algorithm (although it needs tweaking). It's a really nice carrot to reward the best websites with. But let's not carried away. I think that most people are not going to click that "add to home screen" prompt. Let's face it, we've trained people to ignore prompts like that. 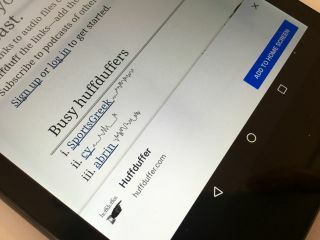 When someone is trying to find some information or complete a task, a prompt that pops up saying "sign up to our newsletter" or "download our native app" or "add to home screen" is a distraction to be dismissed. The fact that only the third example is initiated by the operating system, rather than the website, is irrelevant to the person using the website. My hunch is that the majority of people will still interact with your progressive web app via a regular web browser view. If, then, only a minority of people are going to experience your site launched from the home screen in a native-like way, I don't think it makes sense to prioritise that use case. The great thing about progressive web apps is that they are first and foremost websites. Literally everyone who interacts with your progressive web app is first going to do so the old-fashioned way, by following a link or typing in a URL. They may later add it to their home screen, but that's just a bonus. I think it's important to build progressive web apps accordingly—don't pretend that it's just like building a native app just because some people will be visiting via the home screen. Switch over to HTTPS if you aren't already. Use a service worker, even if it's just to provide a custom offline page and cache some static assets. See? Not exactly a paradigm shift in how you approach building for the web ...but those deceptively straightforward steps will really turbo-boost your site. I'm really excited about progressive web apps ...but mostly for the "progressive" and "web" parts. Maybe I'll start calling them progressive web sites. Or progressive web thangs.